Our focus this week is on the appalling collapse of the rule of law in Great Britain, exemplified in the arrest of a British woman on vague charges of “hate” and in the sentencing of the great Tommy Robinson to thirteen months in jail for publicizing a grooming gang trial. It is now possible, and usual, for British law to be used to terrorize patriotic citizens of the country—to shut them up, lock them up, and even to mark them out for death. A once-free country has become a totalitarian state in thrall to Islamic thugs and willing to destroy patriotic citizens in a desperate bid for temporary peace. Advocates of freedom have been warning about this for many years, and for their pains (it is certainly an unpleasant subject), they have been ridiculed, fined, harshly condemned as “haters,” and now—more and more frequently—jailed. They have been told that they are to blame for the threats, violence, and police brutality that they experience. But what is happening now in Britain must be seen for what it is: the implementation of a Sharia-compliant police state in which the freedoms and security of ordinary Britons have been sacrificed to a hideous ideal of political correctness. Those who cavil or object—and those who remain silent—are all complicit in the destruction of a once-free country. Tommy Robinson was sentenced to a year in prison today. There is a UK publication ban on this story, but Canada’s Ezra Levant and TheRebel.media can give you a full account of what happened. Make no mistake: however Tommy Robinson may have strayed from the straight and narrow over the years, he is a champion of those victimized children, a voice for freedom, and a living rebuke to the cowardice of the British media, police, social workers, and other officials and public figures who knew what was going on in flats in Rotherham, Newcastle, and elsewhere, but stayed silent. 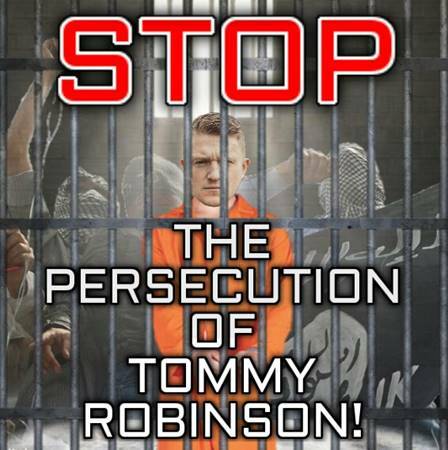 Anyone in the United Kingdom who believes in freedom, recognizes the danger of Islam, and has any self-respect should rally to Robinson’s cause. Britain is now fully a police state, in which people can be arrested and brutalized on nebulous “hate” charges, and have no rights, no recourse. Yes, Britain is finished, and videos such as this one chronicle its demise as a free society. How the movie “Killing Europe” was shut down in Europe and Canada…AND how even talking about the shutdown got shutdown. At the end of a week in which the House of Commons defeated Labour’s draconian plans to regulate the press, the Tories revealed their own draconian plans to regulate the internet. The culture secretary, Matt Hancock, has pledged to make Britain ‘the safest place in the world’ to be online. Politicians want to keep us and themselves safe from supposedly abusive speech. But it’s free speech that is most in need of protection. Ah, the joys of Ramadan continue… this time with a Canadian flavor. It is the ninth day and so far, perhaps owing to the increasing rejection of Islamist doctrines in the Muslim World, things have been relatively quiet. There have only been 42 attacks with 155 deaths world-wide, and one can note only 1 death related to other religious violence and none that can be counted as “Islamophobia” – whatever that is. An explosion caused by an “improvised explosive device” ripped through an Indian restaurant in a mall in the Toronto suburb of Mississauga, wounding 15 people, Canadian police said. “There is no indication that this is a terrorism act. There is no indication that this is a hate crime at this time. We haven’t ruled anything out as we start our investigation,” said Peel Regional Police Chief Jennifer Evans. 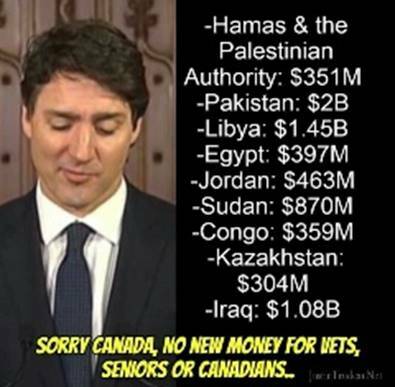 Trudeau showed much more anger and emotion while attacking the Conservatives than he did when discussing Hamas, another example of how Trudeau reserves his anger for Canadians he disagrees with, rather than those who want to destroy everything Canada stands for. By the end of the videos included below, you can see Trudeau becoming enraged and unhinged, as if he thinks having to answer for his statements is somehow ‘below’ him. A banner proclaiming Jewish Heritage Month has been restored to the main foyer of a Toronto high school, following intense grassroots activism by Jewish students. The banner had been removed Tuesday after the principal at Forest Hill Collegiate Institute deemed it “too controversial,” in light of its resemblance to the Israeli flag. The decision to remove the banner in the first place, and the TDSB’s initial reaction to it, leave much to be desired. Take a look at the Google Maps street view of Roxham Rd., the rural road that runs up to the Canada-U.S. border in Champlain, N.Y., and Saint-Bernard-de-Lacolle, Que. It’s illegal to cross there, either by vehicle or foot. It all looks very different now. We’ve since added trailers, tents, chairs, desks and bathrooms. There’s food available on site. What should only be an empty meeting of two dead roads has since turned into a busy border crossing. Prime Minister Trudeau’s reckless border policy has led to more than a fake refugee crisis, now civil war is breaking out between citizens on both sides of the debate. Here’s the truth about what happened at Lacolle, Quebec and the attack against me at the hands of Antifa.. The issue isn’t whether you agree with the political perspective of the people being attacked by Antifa. The issue is that our society can’t survive if political disputes are resolved with violence. We already have people who are supposed to deal with violence within our country: The police. So, Antifa doesn’t reduce violence or bring society together, it increases violence and further destablizes society. The problem with the student residences is that it’s a stopgap measure. By the middle of August, they’ll need it to be vacant to prepare for students returning in September. And given the pace of hearings done by the Immigration and Refugee Board of Canada, it’s not like all the aspiring refugees will learn by then whether their claims have been accepted or denied. It was bound to happen. The left and the fake left would get fed up with the law constantly being broken by those who wish to destroy Canada. Here it comes…the Police and the fake news outlets nationwide are starting to actually report on the dangers that the Liberal Party have forced on us all. The theory of multiculturalism is flawed in two major regards: it operates under the blatantly false principle that different cultures share the same values, and that there would be no conflict of interest between these cultures. Progressivism is a cancer, a degenerative disorder that’s getting worse with each generation, because there is no foundational counterbalance to it. The last Munk Debate, on May 18 in Toronto, was on the complicated question: “What you call political correctness I call progress,” thus inviting disagreement both on the meaning of the term “political correctness,” and on its merits, whatever its meaning is. The participants upholding the view that political correctness was progress were Michael Eric Dyson, an African-American professor of sociology (at Georgetown) and Baptist minister, and Michelle Goldberg, a columnist for The New York Times, the Daily Beast, and Slate. Opposing them were University of Toronto professor of psychology (and successor to the late mayor Rob Ford as the most famous Canadian in the world outside Canada) Jordan Peterson, and English comedian and actor Stephen Fry. It was as much an exercise in cultural anthropology as a debate of the merits of political correctness. Professor Peterson was the only contestant who seriously attempted to address the issue. The CAIR line, eagerly parroted by the Leftist establishment media, is that a small, lavishly funded (alas, no) and interconnected group of “Islamophobes” — including, most notably, Pamela Geller, Frank Gaffney, John Guandolo, David Horowitz, and me — are, out of our insatiable desire for profit, making Americans hate the Prophet. We are, the story goes, a clique of “racists” and “bigots” who have decided to make people hate Muslims because we supposedly make a handsome profit from that hate. This is, of course, arrant nonsense, and a high-ranking CAIR official has now admitted that it knows it is nonsense. Hijra is immigration by jihadists who seek to populate and dominate new lands. They have absolutely no intention of assimilating peacefully in a new host nation. In fact, they scorn the host nation’s traditions and legal systems. Rather, hijrah is a means to “colonize and then transform non-Muslim target societies since the ultimate goal is global submission to sharia law.” This is a far more dangerous and insidious undermining of America continues unabated. It seeks to ultimately destroy the foundations of American values. “Among the names of all those who detonated explosive belts in Europe or America,” he went on, “one cannot find a single Hindu or Buddhist name. They always have Muslim names. Furthermore, how come Muslims always oppose modernity?” Montaser’s harsh criticism should be understood as a call, similar to that of other caring Muslims “trying to fix this,” not to abandon Islam, but to modernize or to risk remaining “at the tail end of all the nations.” It is a call worth heeding. This is Egypt’s response to French call to revise the Koran. The notion that Muslims will willingly strike out certain verses from the Koran because they upset or threaten infidels is a nonstarter. From a Muslim perspective, because the Koran is Allah’s word, it cannot be tampered with or altered in anyway (if Sarkozy et al made these claims in certain Muslim countries they would either be incarcerated on blasphemy charges or killed outright). While the international media was wringing its hands over the alleged genocide of the Rohingyas in Myanmar, Jihad Watch was one of the few places where one could get the truth about the Rohingya jihad against Hindus in that country. The Rohingyas began the violence there, and if they weren’t waging jihad in Myanmar, they wouldn’t have suffered any trouble. Under Mohammed bin Salman’s leadership, in late 2017, the Kingdom presented a plan for settling the Israeli-Palestinian conflict more favorable to the Israelis than anything that had preceded it. While not quite saying that the Jewish people have the right to a nation state in their ancestral homeland, MbS did allow that “the Palestinians and the Israelis have the right to have their own land.” This is progress. The Saudis know they need the Americans and Israelis on their side against Iran and are willing to offer up something for that. Husnain Rashid, 31, provided advice on how a ‘lone wolf’ terrorist could carry out an attack with poison, chemicals, bombs and knives, prosecutors claim. He spoke about how to use lasers to shoot down aircraft and to weaken enemy defences by jamming their missile systems hoping he would be asked to go to Syria and fight.’ The terror suspect also allegedly posted a photo of George and said ‘even the royal family will not be left alone’. This horror is surpassed only by the UK government’s obsession with prosecuting anyone who speaks critically of jihad and sharia. Generation Identity (GI) UK co-leader Tom Dupré was fired from his banking position at the City of London firm Standard Chartered earlier this week following a campaign by far-left activist group HOPE not Hate (HnH). The firing comes after HnH and Swedish “anti-hate” organisation Expo, both of which receive funding from left-wing billionaire George Soros’s Open Society Foundations, were included in a Swedish Defence Research Agency (FOI) report on far-left extremist violence. It’s been a year since 22 people, including young girls, were slaughtered at a pop concert in Manchester. The speed with which this murderous act disappeared from public consciousness was alarming, and not accidental. Anyone who bristles at the new extremism and insists it is something we must talk about and tackle, can expect to be branded an ‘Islamophobe’. The ‘phobe’ slur is used to shame people into silence. This is what Manchester revealed: terrorists hold our lives in contempt, and the political set holds our opinions in contempt. When speaking out against Islam at Speakers’ Corner, one immediately finds oneself surrounded by Muslims in a circle formation. It’s akin to red Indians circling a cowboy wagon. It is intimidation tactics, and it ensures that there will be no escape for anyone who crosses the line. These legends demand a shout-out. They will go down in history as being integral players in the battle for Speakers’ Corner, a microcosm or metaphor for the rest of the UK. “Is What’s Happening in Europe Going to Happen to America, Too?” Editor-in-Chief of Breitbart London, Raheem Kassam, says we’re already on our way. Kassam, author of No Go Zones: How Sharia Law Is Coming to a Neighborhood Near You, spoke recently at a panel hosted by the Center in Dallas, Texas. 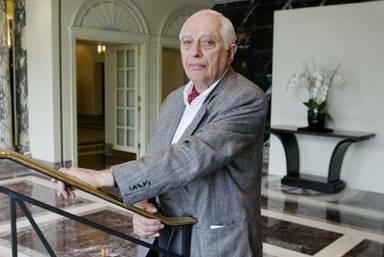 A preeminent scholar of Middle Eastern history whose work profoundly shaped Western views of the region including fears of a “clash of civilizations”.